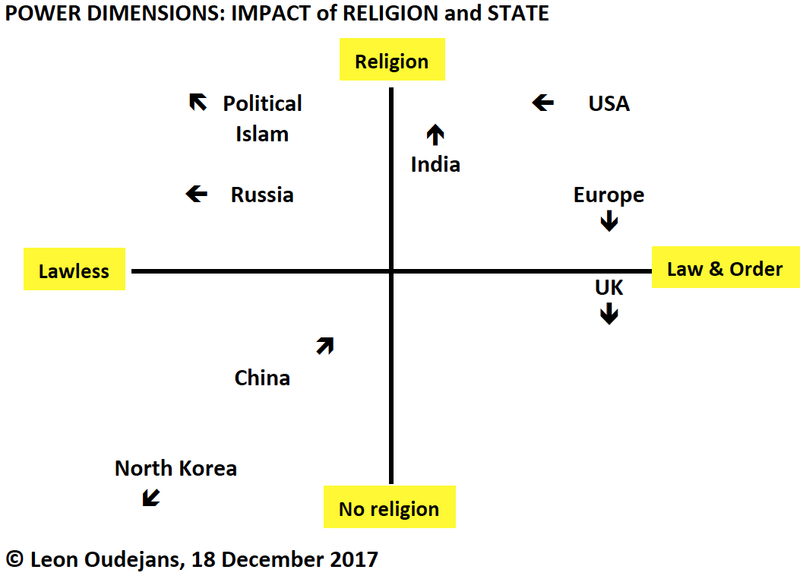 I have been working on a new diagram for a while that is plotting the Power dimensions Law & Order versus Religion. Law & Order is a combination of the Belief systems Money and Politics. 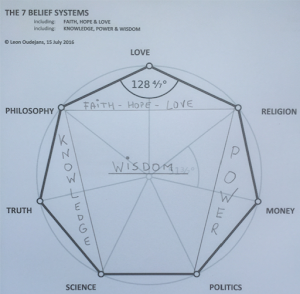 The resulting diagram (below) also indicates natural allies and natural enemies. The high degree of secularization in the UK makes the UK more and more a lonely boy in class. In reality the UK is also drifting away from both Continental Europe and USA. The secularization in Continental Europe is both high and low. The average still warrants a position in the upper-right corner. Trump's USA is moving to the left following its admiration for authoritarian leaders. At home, it keeps undermining Law & Order. China was the most difficult one to plot in this diagram as there are also reasons to indicate different directions (ie, below, left, up). In general, I expect that establishing Law & Order in China is essential for its aim of overtaking the USA as the leading Superpower. Religion in China is also gaining ground (eg, Telegraph-2014). 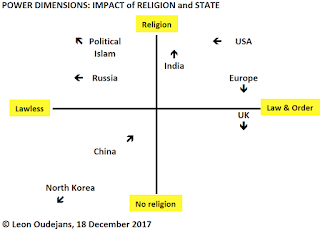 The Political Islam (my blogs) remains the most dangerous development as it combines authoritarianism and religious extremism behind a facade of democracy. The recent developments in Wahhabi Sunni Saudi Arabia are spectacular but might be short-lived. The previous Crown Prince survived 4 assassination attempts (Wiki). The position of Russia in the upper left corner fits its current role in the Middle East (eg, Syria). Russian involvement is usually about protecting and/or expanding its vital interests (eg, Crimean annexation, Syrian Khmeimim Air Force Base). One of these Russian interests is gaining control over the Bosporus (eg, Hurriyet-2015). Recently, Turkey argued with Greece on the 1923 Treaty of Lausanne (eg, Guardian, Hurriyet). The Turkish control over the Bosporus - and indirectly the Black Sea and its Russian Fleet - was finally settled in the 1936 Montreux Convention. Turkey may have opened Pandora's box as Russia is eager to reclaim its former control over the Bosporus (my blogs #1, #2, #3, #4 and #5). Turkey's 2016-17 purges following its alleged 2016 military coup attempt has made its army (very) vulnerable (eg, CNN, FT, Jane's, Spiegel). The mutual history of Russia and Turkey shows a long list of military conflicts (Wiki). As long as Turkey is a NATO member, its Article 5 should prevent a new Russo-Turkish war. The upper-left box remains a danger zone.